Browse: Home /	Events, Recycling / Post-Holiday Recycling Event! Are you expecting a new iPod or DVD player or computer from Santa? 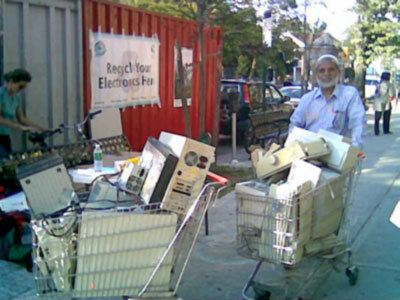 Don’t throw the old one in the garbage — save it for Sustainable Flatbush’s Post-Holiday E-Waste Recycling event! If the stars align correctly, we will make some local pickups with a cargo bike! Discarded computers and electronics are toxic hazardous waste! Keep your unwanted electronics out of the landfill by bringing them to this neighborhood e-waste recycling event. **Gets sent to www.greendisk.com – if you have a lot of media please go to the website, pay a small fee, download an address label and send it directly to them. All materials collected will be recycled via Lower East Side Ecology Center‘s partnership with BuildItGreen. Additional information about e-waste recycling is available here. This event is co-sponsored by Lower East Side Ecology Center and Flatbush Development Corporation. Hi – our block association would like to rally residents to bring their electronics to your recycling event — would that be okay? Am trying to find a couple of people to transport my large TV to the site. Is there anything organized for pick-ups? (am also trying to volunteer at the site). hi julia. email me (the link is here on the site) and let’s try to figure something out for pickup. and for sure all volunteers are welcome! s darby, you should check out Freecycle or Craigslist, where people are always giving away monitors. they are generally CRTs, but hey, they are free…. It looks like they are haveing a great turnout today (Sat.). We managed to get three apts here cleaned out with the help of a borrowed hand truck. Thanks for helping get this organized.